The game had a very big importance for second-ranked Shimane Magic as it allowed them to take a leadership position. Shimane Magic defeated 5th ranked Bambitious Nara at home 77-64. Shimane Magic had a 34-22 advantage in offensive rebounds. They looked well-organized offensively handing out 25 assists. The best player for the winners was Venezuelan center Gregory Echenique (206-90, college: Creighton, agency: Pensack Sports) who had a double-double by scoring 21 points and 16 rebounds. Hungarian Rosco Allen (208-93, college: Stanford, agency: Pensack Sports) chipped in 20 points and 14 rebounds. American power forward Gary Hamilton (208-84, college: Miami, FL, agency: Inception Sports) produced a double-double by scoring 12 points, 13 rebounds and 6 assists for the guests. Both coaches used bench players which allowed the starters a little rest for the next games. Shimane Magic (28-10) have an impressive eight-game winning streak. As mentioned above they are at the top of the standings, which they share with Gunma. Bambitious Nara lost third consecutive game. They keep the fifth place with 27 games lost. Bambitious Nara will have a break next week, which should allow them to rest in order to get back on the winning path. Shimane Magic will try to continue on its current victory against fifth ranked Bambitious Nara at home. Top ranked Kumamoto V. (27-11) recorded its eleventh loss at the home court. Hosts were defeated by fourth ranked Fukushima (18-20) 118-110. It ended at the same time the two-game winning streak of Kumamoto V.. Vincentian power forward Nyika Williams (203-87, college: Pacific) orchestrated the victory by scoring 34 points (!!!) and 6 rebounds. Chris Brady contributed with 22 points, 14 rebounds and 6 assists for the winners. American forward Chehales Tapscott (195-90, college: Portland St.) replied with a double-double by scoring 35 points (!!! ), 14 rebounds and 7 assists for Kumamoto V.Fukushima moved-up to third place, which they share with Nishinomiya S. Kumamoto V. at the other side dropped to the second position with 11 games lost. Fukushima will have a break next round, and it should allow them to practice more before next game. Kumamoto V. will play again at home against Fukushima and it may be a tough game between close rivals. An exciting game between Top Four teams was played in Hiroshima. Second ranked Cyberdyne IR faced one of their biggest challengers Dragonflies. Guests from Tsukuba (24-15) defeated host Dragonflies (26-13) 98-91. The game was dominated by American players. Scootie Randall had a double-double by scoring 20 points, 9 rebounds and 13 assists to lead the charge for the winners. Terrell Miller-Jr responded with a double-double by scoring 26 points, 13 rebounds and 6 assists. Despite that victory Cyberdyne IR went down to third position due to points difference which they share with defeated Dragonflies. Newly promoted Dragonflies keep the third place with 13 games lost. Both teams do not play next round, which will be an opportunity for some rest. An exciting game between Top Four teams was played in Nagano. First ranked Shinshu BW faced 4th ranked Orange Vikings. Host Shinshu BW (30-8) smashed guests from Matsuyama (16-22) 96-77. It ended at the same time the two-game winning streak of Orange Vikings. Wayne Marshall notched 36 points (!!!) (on 15-of-16 shooting from the field) to lead the effort. Both coaches tested many bench players and allowed the starting five to rest. Shinshu BW maintains first position with 30-8 record. Orange Vikings at the other side keep the fourth place with 22 games lost. Shinshu BW's next round opponent will be again Orange Vikings (#4) in Matsuyama. An exciting game between Top Four teams was played in Hyogo. First ranked Gunma faced 3rd ranked Nishinomiya S.. Guests from Gunma (28-10) defeated host Nishinomiya S. (18-20) 75-57. The best player for the winners was Abdullahi Kuso who had a double-double by scoring 19 points, 16 rebounds and 8 assists. Both coaches allowed to play bench players saving starting five for next games. Gunma have a solid four-game winning streak. They maintain first position with 28-10 record, which they share with Shimane SM. Loser Nishinomiya S. keeps the third place with 20 games lost. Gunma will have a break next round. Nishinomiya S. will play again at home against the league's leader Gunma and it may be a tough game between close rivals. Toyotsu FE defeated Yamagata in Nagoya 87-79. Kanazawa Sam. beat Tokyo HT at home 85-73. Aomori Watts lost to Tokyo Z on the opponent's court 79-91. Sendai 89ers managed to outperform Kagawa FA in a home game 95-82. Tokyo HT recorded a loss to Kanazawa Sam. on the road 98-90. Hiroshima D. crushed Cyberdyne IR on its own court 93-71. There was no surprise when 5th ranked Yamagata (16-22) was defeated at home by second ranked Toyotsu FE (24-14) 87-79 on Saturday. Toyotsu FE looked well-organized offensively handing out 24 assists. The best player for the winners was American forward Josh Hawkinson (208-95, college: Washington St.) who had a double-double by scoring 28 points, 10 rebounds and 5 assists. 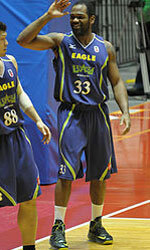 The other American import forward Cherif Sow (201-92) chipped in a double-double by scoring 24 points and 10 rebounds. American-Panamanian forward Gyno Pomare (203-86, college: San Diego) produced a double-double by scoring 18 points and 15 rebounds and guard Hiroki Furuhashi (185-92) added 22 points respectively for the hosts. Four Yamagata players scored in double figures. Toyotsu FE maintains second position with 24-14 record having four points less than leader Shinshu BW, which they share with Sendai 89ers. Loser Yamagata dropped to the fourth place with 22 games lost. Toyotsu FE will have a break next round. Yamagata will play again at home against the league's second-placed Toyotsu FE (#2) and it may be a tough game between close rivals. No shocking result in a game in Ishikawa where fourth ranked Kanazawa Sam. (16-23) defeated 6th ranked Tokyo HT (6-33) 85-73 on Friday. Kanazawa Sam. looked well-organized offensively handing out 30 assists. The best player for the winners was American power forward Denzel Bowles (208-89, college: JMU) who had a double-double by scoring 28 points, 11 rebounds and 6 assists. Jamaican-American power forward Ryan Reid (204-86, college: Florida St.) chipped in 17 points, 9 rebounds and 4 assists. Four Kanazawa Sam. players scored in double figures. Kanazawa Sam. 's coach Hotta Takeshi used a ten-player rotation saving starting five for next games. American power forward Alex Jones (206-87, college: Seattle) produced a double-double by scoring 22 points and 12 rebounds and guard Hiroya Ogane (180-89) added 16 points and 11 assists respectively for the guests. Kanazawa Sam. maintains fourth position with 16-23 record. Tokyo HT lost fifth consecutive game. Newly promoted team keeps the sixth place with 33 games lost. Both teams do not play next round, which will be an opportunity for some rest. The game between closely ranked teams ended with 6th ranked Aomori Watts' (11-27) road loss to fifth ranked Tokyo Z (13-25) 79-91 on Saturday. Tokyo Z dominated down low during the game scoring 58 of its points in the paint compared to Aomori Watts' 28. They outrebounded Aomori Watts 50-26 including a 21-3 advantage in offensive rebounds. Tokyo Z looked well-organized offensively handing out 25 assists. The best player for the winners was South Sudanese forward Mogga Lado (201-95, college: Campbell) who had a double-double by scoring 24 points and 15 rebounds. American center Nigel Spikes (208-89, college: Marshall) chipped in a double-double by scoring 19 points and 10 rebounds. Four Tokyo Z players scored in double figures. Tokyo Z's coach Satoru Furuta used an eleven-player rotation saving starting five for next games. Lithuanian power forward Julius Jucikas (205-89, agency: Octagon Europe) produced 33 points (!!!) and 7 rebounds and point guard Toshio Kan (184-94) added 12 points, 10 rebounds and 6 assists respectively for the guests. Tokyo Z maintains fifth position with 13-25 record. Loser Aomori Watts keep the sixth place with 27 games lost. Tokyo Z will face again Aomori Watts (#6) at home in the next round. An exciting game between Top Four teams was played in Hiroshima. Second ranked Cyberdyne IR faced one of their biggest challengers Dragonflies. Guests from Tsukuba (24-15) defeated host Dragonflies (26-13) 98-91. Cyberdyne IR made 23-of-26 free shots (88.5 percent) during the game. They looked well-organized offensively handing out 26 assists. The game was dominated by American players. Forward Scootie Randall (198-90, college: Temple) had a double-double by scoring 20 points, 9 rebounds and 13 assists to lead the charge for the winners and power forward Carl Baptiste (208-90, college: Delaware) chipped in 15 points, 8 rebounds and 4 assists during the contest. Five Cyberdyne IR players scored in double figures. Forward Terrell Miller-Jr (203-95, college: Murray St., agency: Duran International) responded with a double-double by scoring 26 points, 13 rebounds and 6 assists and forward Carl Landry (206-83, college: Purdue) scored 27 points and 8 rebounds. Despite that victory Cyberdyne IR went down to third position due to points difference which they share with defeated Dragonflies. Newly promoted Dragonflies keep the third place with 13 games lost. Both teams do not play next round, which will be an opportunity for some rest. Rather predictable result when third ranked Sendai 89ers (24-14) beat at home 6th ranked Kagawa FA (8-29) 95-82 on Saturday. Sendai 89ers made 17-of-20 free shots (85.0 percent) during the game. They shot the lights out from three sinking 12 long-distance shots on high 52.2 percentage. Sendai 89ers looked well-organized offensively handing out 27 assists. The game was also dominated by American players. The best player for the winners was forward Jerome Tillman (201-87, college: Ohio, agency: Inception Sports) who had a double-double by scoring 23 points, 13 rebounds and 6 assists. Center Daniel Miller (211-91, college: Georgia Tech) chipped in a double-double by scoring 10 points and 11 rebounds. Five Sendai 89ers players scored in double figures. Sendai 89ers' coach Dai Oketani used a ten-player rotation saving starting five for next games. Guard Terrance Woodbury (201-87, college: Georgia) produced a double-double by scoring 22 points, 7 rebounds and 10 assists and forward Reginald Warren (204-81, college: W.Florida, agency: Inception Sports) added 17 points, 13 rebounds and 4 assists respectively for the guests. Sendai 89ers moved-up to second place, which they share with Toyotsu FE. Loser Kagawa FA keeps the sixth position with 29 games lost. Sendai 89ers will face again Kagawa FA (#6) in Takamatsu in the next round. An exciting game between Top Four teams was played in Nagano. First ranked Shinshu BW faced 4th ranked Orange Vikings. Host Shinshu BW (30-8) smashed guests from Matsuyama (16-22) 96-77. It ended at the same time the two-game winning streak of Orange Vikings. Shinshu BW players were unselfish on offense dishing 29 assists. They brought some defensive toughness making 7 blocks. American center Wayne Marshall (211-86, college: Temple) notched 36 points (!!!) (on 15-of-16 shooting from the field) to lead the effort and guard Kaito Ishikawa (188-90) supported him with 12 points and 7 assists. Even a double-double of 19 points, 12 rebounds and 5 assists by American swingman Lakeem Jackson (195-90, college: S.Carolina, agency: SDJ Sports) did not help to save the game for Orange Vikings. His fellow American import power forward Andrew Fitzgerald (202-90, college: Oklahoma) added 21 points and 9 rebounds for the guests. Both coaches tested many bench players and allowed the starting five to rest. Shinshu BW maintains first position with 30-8 record. Orange Vikings at the other side keep the fourth place with 22 games lost. Shinshu BW's next round opponent will be again Orange Vikings (#4) in Matsuyama. Not a big story in a game in Ishikawa where 6th ranked Tokyo HT (6-33) was defeated by fourth ranked Kanazawa Sam. (16-23) 98-90 on Saturday. Kanazawa Sam. made 16-of-18 free shots (88.9 percent) during the game. They looked well-organized offensively handing out 23 assists. The best player for the winners was American power forward Denzel Bowles (208-89, college: JMU) who had a double-double by scoring 36 points (!!!) and 19 rebounds. Jamaican-American power forward Ryan Reid (204-86, college: Florida St.) chipped in a double-double by scoring 14 points, 12 rebounds and 7 assists. American power forward Alex Jones (206-87, college: Seattle) produced a double-double by scoring 30 points and 15 rebounds and his fellow American import center Jordan Richard (206-89, college: CS Los Angeles, agency: Slash Sports) added 18 points and 11 rebounds respectively for the guests. Four Kanazawa Sam. and five Tokyo HT players scored in double figures. Kanazawa Sam. maintains fourth position with 16-23 record. Tokyo HT lost fifth consecutive game. Newly promoted team keeps the sixth place with 33 games lost. Both teams do not play next round, which will be an opportunity for some rest. Top ranked Kumamoto V. (27-11) recorded its eleventh loss at the home court. Hosts were defeated by fourth ranked Fukushima (18-20) 118-110. It ended at the same time the two-game winning streak of Kumamoto V.. Fukushima dominated down low during the game scoring 82 of its points in the paint compared to Kumamoto V.'s 62 and made 24-of-30 charity shots (80.0 percent) during the game. Fukushima players were unselfish on offense dishing 32 assists. Kumamoto V. was plagued by 26 personal fouls down the stretch. Vincentian power forward Nyika Williams (203-87, college: Pacific) orchestrated the victory by scoring 34 points (!!!) and 6 rebounds. American center Chris Brady (208-95, college: Monmouth) contributed with a double-double by scoring 22 points, 14 rebounds and 6 assists for the winners. American forward Chehales Tapscott (195-90, college: Portland St.) replied with a double-double by scoring 35 points (!!! ), 14 rebounds and 7 assists and Dutch-Australian power forward Josh Duinker (209-89, college: Richmond) added 26 points, 13 rebounds and 6 assists in the effort for Kumamoto V.Both teams had four players each who scored in double figures. Fukushima moved-up to third place, which they share with Nishinomiya S. Kumamoto V. at the other side dropped to the second position with 11 games lost. Fukushima will have a break next round, and it should allow them to practice more before next game. Kumamoto V. will play again at home against Fukushima and it may be a tough game between close rivals. An exciting game between Top Four teams was played in Hyogo. First ranked Gunma faced 3rd ranked Nishinomiya S.. Guests from Gunma (28-10) defeated host Nishinomiya S. (18-20) 75-57. Gunma looked well-organized offensively handing out 26 assists. The best player for the winners was Nigerian forward Abdullahi Kuso (206-84, college: Tallahassee CC) who had a double-double by scoring 19 points, 16 rebounds and 8 assists. American forward Thomas Kennedy (201-87, college: Detroit Mercy) chipped in 18 points, 6 rebounds and 6 assists. American center Brad Waldow (208-91, college: St.Mary's, CA, agency: Octagon Europe) produced 7 points, 7 rebounds and 4 assists and swingman Naoki Tani (193-88) added 6 points and 5 rebounds respectively for the hosts. Both coaches allowed to play bench players saving starting five for next games. Gunma have a solid four-game winning streak. They maintain first position with 28-10 record, which they share with Shimane SM. Loser Nishinomiya S. keeps the third place with 20 games lost. Gunma will have a break next round. Nishinomiya S. will play again at home against the league's leader Gunma and it may be a tough game between close rivals. The game had a very big importance for second-ranked Shimane Magic as it allowed them to take a leadership position. Shimane Magic defeated 5th ranked Bambitious Nara at home 77-64. Shimane Magic had a 34-22 advantage in offensive rebounds. They looked well-organized offensively handing out 25 assists. The best player for the winners was Venezuelan center Gregory Echenique (206-90, college: Creighton, agency: Pensack Sports) who had a double-double by scoring 21 points and 16 rebounds. Hungarian Rosco Allen (208-93, college: Stanford, agency: Pensack Sports) chipped in a double-double by scoring 20 points and 14 rebounds. Four Shimane Magic players scored in double figures. American power forward Gary Hamilton (208-84, college: Miami, FL, agency: Inception Sports) produced a double-double by scoring 12 points, 13 rebounds and 6 assists and his fellow American import forward Jeffrey Parmer (203-85, college: Florida Atlantic) added 14 points and 6 rebounds respectively for the guests. Both coaches used bench players which allowed the starters a little rest for the next games. Shimane Magic (28-10) have an impressive eight-game winning streak. As mentioned above they are at the top of the standings, which they share with Gunma. Bambitious Nara lost third consecutive game. They keep the fifth place with 27 games lost. Bambitious Nara will have a break next week, which should allow them to rest in order to get back on the winning path. Shimane Magic will try to continue on its current victory against fifth ranked Bambitious Nara at home. We could consider it a predictable result in the game between close teams in Hiroshima where third ranked Dragonflies (26-13) outleveled second-ranked Cyberdyne IR (24-15) 93-71 on Saturday. Dragonflies made 22-of-22 free shots (100 percent !!!) during the game. They looked well-organized offensively handing out 25 assists. The best player for the winners was American forward Carl Landry (206-83, college: Purdue) who had a double-double by scoring 26 points, 13 rebounds and 6 assists (was perfect 10-for-10 from the free throw line !!!). The former international forward Shogo Asayama (192-81) chipped in 25 points (was perfect 8-for-8 from the free throw line). Four Dragonflies players scored in double figures. American forward Scootie Randall (198-90, college: Temple) produced 24 points, 7 rebounds and 7 assists and his fellow American import forward Connor Lammert (206-94, college: Texas) added 16 points and 12 rebounds respectively for the guests. Cyberdyne IR's coach Kazuto Uehara gave up on the game allowing to play ten players seeing no chance for a win. Newly promoted Dragonflies maintains third position with 26-13 record having just one point less than leader Shinshu BW which they share with defeated Cyberdyne IR. Loser Cyberdyne IR dropped to the third place with 15 games lost. Both teams do not play next round, which will be an opportunity for some rest.